Elvis Presley concerts from 1976 - for collectors it was a dry area for a long time, if we talk about soundboard recordings. Now the situation is very different and it is from this year the majority soundboards - and also the best ever recordings from a technical point of view - comes. The first ever soundboard release was the CD 'Hurt' with an incomplete show from Charleston 24th July, Evening show. This CD was printed on damaged blank CDs and in the sound were hundreds of the dropouts which makes listening almost unbearable. The Charleston show wasn't very exciting, Elvis sounds tired and bored, however both performances of the title song are strong. At the fall of 1994 were announced two new Fort Baxter's CDs, 'Moody Blue And Other Great Performances' and 'Bicentennial Elvis Experience'. I was naturally excited especially when I got the information that 1976 concert contains ultra rare rendition of 'Return To Sender'. Few weeks after I read a review where one guy wrote that the sound quality is excellent but Elvis does sound ill. I sent the money for my copy and waited. First off all, this guy was right. The sound quality of this bootleg is exceptionally well. The mixing is almost faultless and all the instruments are clear. The sound is a bit pulsating and is different compared with other live CDs. The cover design is fair, with photo of Elvis in "Indian Feather" jumpsuit, taken at the fall of 1976 and one more, smaller picture of Elvis wearing "Bicentennial" suit. Now the concert - I don't say it gladly, but it is the worst ever Elvis concert that I have heard, if I rate his voice condition, which is very poor. He sounds very exhausted and his voice is hoarse, very rough also when he talks between the songs. Two other 1976 concerts where Elvis isn't in his best voice, released on above mentioned 'Hurt' and the more recent 'Southbound' are both great in comparison. However, he is in good mood, and in any case not 'out of it all' like in College Park, September 27 & 28 1974. But still, 'See See Rider' and 'I Got A Woman' aren't so bad. I think that Elvis must realize very well how weak his voice was, when he heard himself from the stage monitor. It sounds almost like an apology when he says: "we had a late show last night and I only got two hours sleep, so...", "well that's how I feel, really ". After 'Amen' he greets the people: "Good afternoon ! God, that sounds strange, good afternoon, I just got up !" The worst to come: Elvis is totally unable hit the notes in 'If You Love Me' and 'You Gave Me A Mountain' and these two performances are almost unbearable. There isn't much to say about ordinary rock and roll medley, but in 'And I Love You So' Elvis sounds fair and this song is one of the better from this show. Also 'Fever' is okay, longer than usual, with an additional repeated verse. 'America', on other side, is the weakest version of all that I know. Right after it Elvis starts introduction, but someone gave request and Elvis takes it immediately: "..please sing Return To Sender...". "Honey, if we know it", Elvis says, and then he sings an almost full version of it. It is the best performance of the evening, what a pity that it only last about two minutes... This song was extremely rare in the repertory, I know only two other more complete ones; from Asheville, July 24 1975 (where Elvis also gave 'Wooden Heart' and 'Pieces Of My Life') and from Lake Tahoe, May 9 1976 (probably the longest show ever, with a nice 'The First Time Ever I Saw Your Face'). "I'm sorry, but we hadn't rehearsed that too much", he says and then introduces the band. We have a short but nice 'Early Mornin' Rain', a long Ronnie Tutt drums solo and Elvis then sung a few lines from Johnny Horton's country classic 'Battle Of The New Orleans' to the tune of Jerry Scheff's fender bass solo. In 'Love Letters' is his voice again weak, very trembling. After 'School Day' theme Elvis goes into 'Hurt' it really wasn't good choice for this evening as this song is built on the voice alone. "Hold it a minute, I gotta get to this girl's underwear..." (! ), he says during the beginning, and when he start singing, for most of time it sounds terrible, but when Elvis repeated the ending (usually sign of his mood) to wild audience, it is far better, with high note at the very end. Awful 'Hound Dog' is next, after it you can hear him say "Good golly miss Molly..". 'Funny How Time Slips Away' and 'Can't Help Falling In Love' closes the set. It was reported many times that July - August period in Elvis 'Concert Years' was likely worst ever, as he was often tired and not feeling to well. He was also more overweight than later this year. But still, there aren't many shows like this one. One thing is strange - when you listen to this CD, you will hear strong ovations after the songs; it seems that the audience didn't notice imperfections in the show. The explanation could be that it is very different, when you are in concert arena in the middle of thousand screaming fans, compared to when you sit in the room in front of your stereo system. Since this bootleg we got many more 1976 soundboard CDs, including some really excellent ones, where Elvis is in superb vocal condition and great mood. Try 'Hot Winter Night In Dallas', 'Burning In Birmingham', but also 'Goodbye Memphis' and you will know. 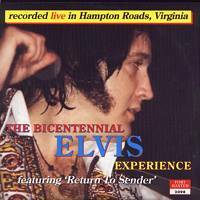 But the Hampton Roads concert is still a very interesting listening, you can imagine how shattering effect these tours have on Elvis undermined health. © Oto Meszaros, Czech Republic, March 15 1999.